Next month, family-based applicants should consult the Final Action Dates chart for May (see below). Please note that this differs from last month, where applicants were instructed to consult the Filing Dates chart instead. The May chart shows minimal movement, with most categories moving forward by one month. However, the F2A category moved back by approximately four months and the F2B category moved forward by approximately four months. Employment-based applicants should consult the Final Action chart for May (see below), which saw some forward movement relative to the April chart in the EB-3 categories. However, EB-3 India only saw its cutoff date advance by one day. 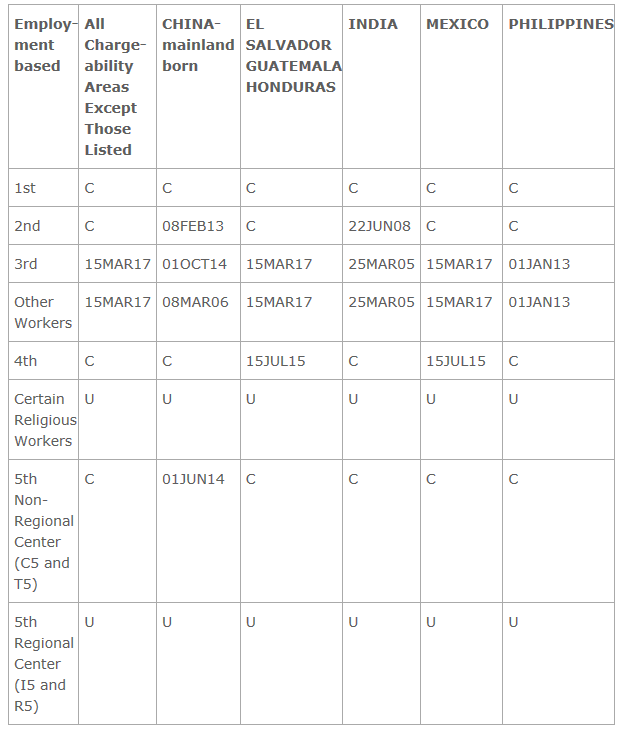 Importantly, there were significant changes to the Certain Religious Workers and 5th Regional Center (I5 and R5) categories, which are all listed as “Unavailable” for May. 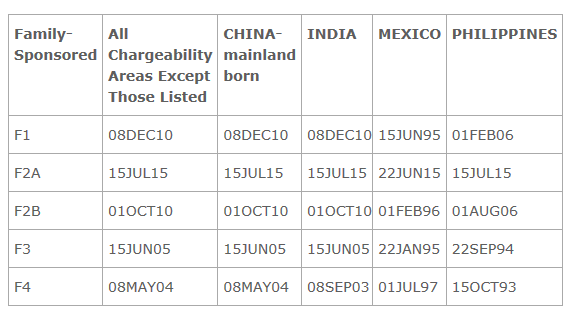 While EB-1 categories, including EB-1 China and EB-1 India, are “current,” meaning anyone who is ready to submit their adjustment application is free to do so, the DOS noted that demand for adjustment of status cases increased dramatically and corrective action to hold number use within these annual limits will likely be required. The DOS also noted that there was increased demand for adjustment in the EB-2 categories and that the categories for Worldwide, El Salvador, Guatemala, Honduras, Mexico and the Philippines can be expected to become oversubscribed no later than July.